Public Health England head of digital strategy Mary Black, who lost her father and grandfather to smoking-related diseases, has urged nurses who smoke to lead by example and kick the habit. Nursing Standard readers have their say. It is quite off-putting to be cared for by someone who smells like an ashtray, and it would be good for patients if all healthcare professionals did not smoke, but this is the real world and we will not stop nurses from smoking completely. Employers need to look more closely at the reasons why health professionals smoke, such as stress, and give staff time to attend health-related seminars to address these issues. Nurses who smoke should quit, those taking alcohol should cease, and overweight nurses should lose weight. The problem is that nurses are people, they are not holier than thou, and have the same weaknesses and foibles as the rest of the population. All NHS sites should be non-smoking, and nurses should abide by this, but they need support to make healthy lifestyle decisions, not chastising. Perfect people are not real and real people are not perfect. Employers have a duty to look after their staff – their best resource – and need to support them to stay healthy, including offering smoking cessation support to those who need it. But how would employers ensure nurses quit smoking? They barely seem to manage work-related stress among staff, and many of us can’t even get healthy meals at work. Nurses have a duty of care, we don’t have a duty to be healthy. This is dangerous moralising and potentially discrimination. 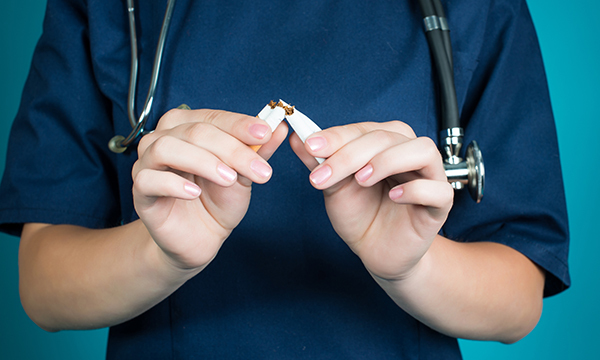 Smokers need encouragement and structured support to quit, and employers should make every effort to help nurses stop smoking. But the rationale for this is not to set an example to patients, many of whom understand that most of us have some form of health-damaging behaviour. Far more nurses are overweight or obese than are smokers, yet they are not demonised. Employers need a deeper understanding of how issues such as workplace stress can influence health-related behaviours among the caring profession.